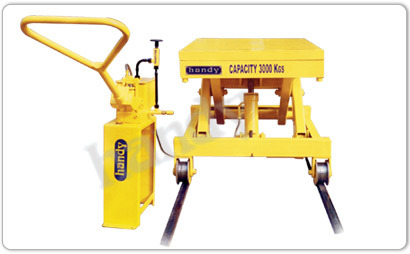 For men and material to reach heights upto 3 mtrs with loads upto 500 Kgs. and in order to economic handling considerations, the manual fixed scissor tables have been introduced in two versions. With the operating handle on the top platform so that, it becomes a one man show. 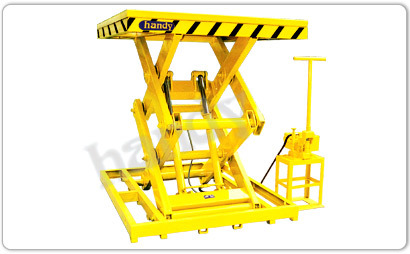 The operator loads the tools & tackle on the shop floor at a particular place in the shop and standing on the top platform operates the handle to raise the table to the desired height and do the job and after the work is over, lowers the table by short strokes of the handle. All other features of the table are similar to the motorized scissor tables described earlier. Alternatively, the table is operated from the floor level. In this case, though it is a cheaper proposition, two operators may be needed, one on the top platform to do the job and the other on the floor to raise and lower the table.